The 2009-10 season was similar to ones in years past for the Massachusetts hockey team. UMass started the season as one of the nation’s best and then went on a second-half skid. While the season didn’t end the way the Minutemen had envisioned it, there were still plenty of bright spots and stellar performances. Here are hockey beat writers, Jeffrey R. Larnard and Jay Asser’s, end-of-the-year awards. James Marcou may have led the team in points and assists while Casey Wellman led in goals, but Braun was an offensive threat while also being the best defensemen on the team. His eights goals and 23 assists placed him third on the team with 31 points and his plus 3 rating was good for second on the team, while possibly seeing more ice time than any one in the conference. 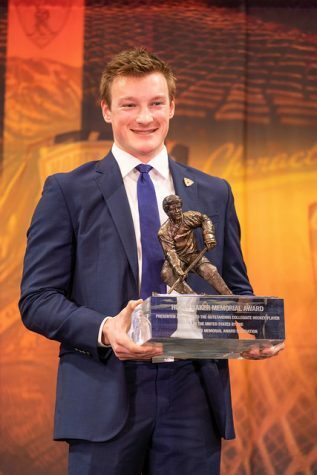 His work earned him Hockey East First Team honors, the only member of the team to be named to the first team. Most importantly was the senior’s will to lift his team to the Hockey East tournament with five points (four goals) on the final weekend of the regular season at Maine. 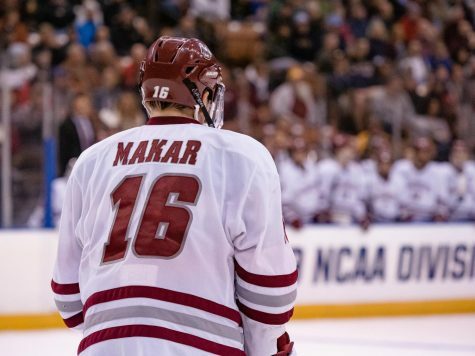 Don’t be fooled by the size, though he’s usually the smallest player on the ice, J. Marcou was the most important player for UMass this season. He may not be the most physically gifted player on the team, but his size fits his game perfectly. Weaving through defenders with his quickness, J. Marcou would rather add to his team’s goal total before his own. Though he’s not the leading goal scorer for the Minutemen, J. Marcou is involved in a significant portion of UMass’ scoring. The forward finished the season with 40 assists, second only to Maine’s Gustav Nyquist (42) in the nation. Along with his 11 goals, J. Marcou totaled 51 points to place him fifth in all of college hockey. As one of the most creative playmakers in the country, J. Marcou is the sparkplug that makes the potent Minutemen offense go. After notching just one assist in his freshman year while playing in 20 games, M. Marcou saw significant minutes in his sophomore year including time on both special team units. In the extra playing time, M. Marcou came up big with seven goals and three assists. Two of the defensemen’s seven goals were the deciding goal in a game, including his first collegiate goal, which came against Maine earlier in the year. The other game came in the first win of a weekend sweep over sister school UMass Lowell. As a senior, Ortiz was entering his final season with a last chance to make a mark on UMass. After having his best season as a freshman in 2006-07 when he led all rookies on the team in goals (seven), assists (14), and total points (21), Ortiz’s production was on the decline the past two years. This season, Ortiz ranked second on the Minutemen in goals (13) and fifth in assists (13), finishing with 26 points. His mark in goals matched his total amount of scores over the past two years, while his tally in assists was one more than he had in his sophomore and junior seasons combined. Ortiz stepped up and was a key weapon to the UMass attack all season, playing up to the high expectations that were placed on him back as a freshman. At the time the Minutemen were ranked 14th in the country and New Hampshire was coming off a struggling non-conference schedule, but the teams were a lot closer than their records showed. After UMass took a 2-0 lead in the first period, the Wildcats recorded three unanswered goals to take a 3-2 lead. With 11 seconds remaining in regulation Wellman tied the game at three leading to David Boehm’s game-winning goal two minutes into overtime. Paul Dainton was strong in net for the Minutemen recording a career-high 42 saves. 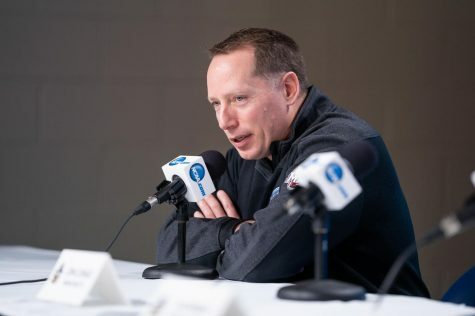 While the game may not have seemed like much of a contest with the teams’ records at the time, the loss for UNH was a spark that led to a seven-game unbeaten streak and a first place finish in the conference standings. 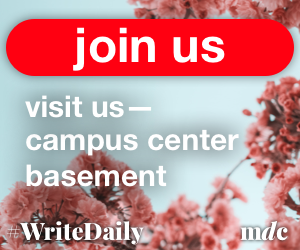 The best game of the season came in mid-November as the UMass fans were treated to a dramatic overtime finish at the Mullins Center. 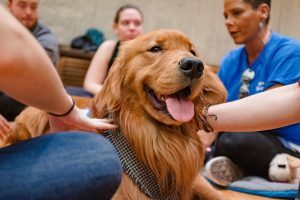 Prior to the front-end of a weekend series with New Hampshire, the Minutemen were in the midst of playing their best hockey of the season. UMass was 6-1 overall and 3-1 in the Hockey East, while the Wildcats were struggling in the early going with a 2-5-2 overall record. The contest was a back-and-forth affair with clean play as only three total penalties were whistled. The Minutemen came out in the first period and took an early 2-0 lead, before UNH responded with a pair of goals in the second frame. The Wildcats took their first lead of the game early in the final period and almost hung on to the win in regulation. With 11 seconds remaining, however, Wellman scored the game-tying goal to send the contest into overtime. Boehm gave the Minutemen the 4-3 victory with a goal in the extra frame for the most dramatic win of the season. 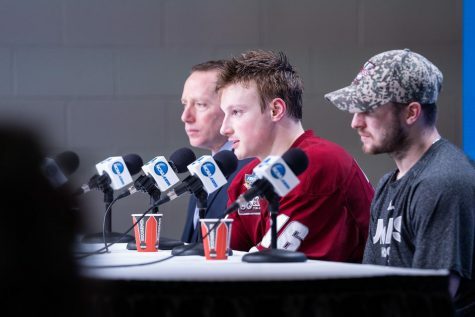 Since that game, UMass and UNH seemingly switched places as the Wildcats finished the season in first place in the Hockey East, while the Minutemen squeaked into the playoffs. With then-No. 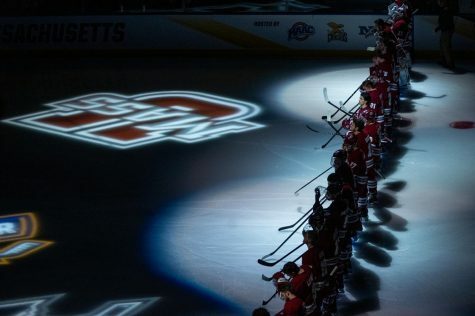 15 UMass and then-No.14 Boston College locked in a tie for second place in the Hockey East standings, the Mullins Center was packed for what was expected to be one of the best games of the year in the Hockey East. 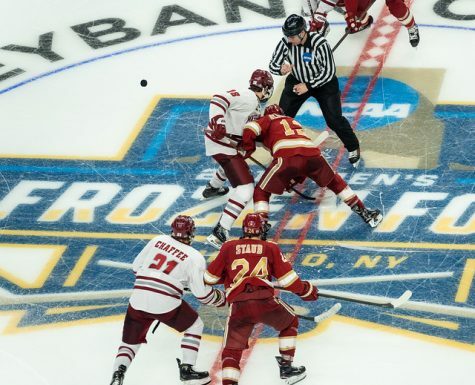 The game televised on NESN turned out to be a bust as the Eagles took a 4-0 lead after just one period, and many fans at the Mullins Center began to file out. By the end of the second period, the lead was 7-0. 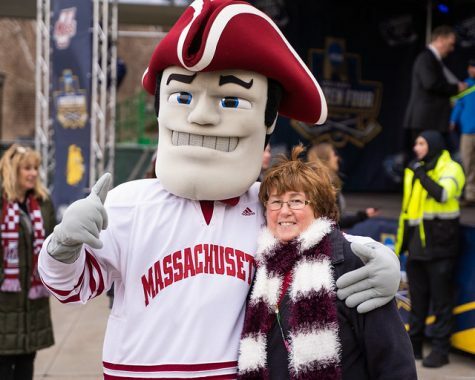 The Minutemen managed one goal in the third period to avoid the shutout, but the loss was the start of a six game losing streak that led UMass to finish seventh in the conference standings. 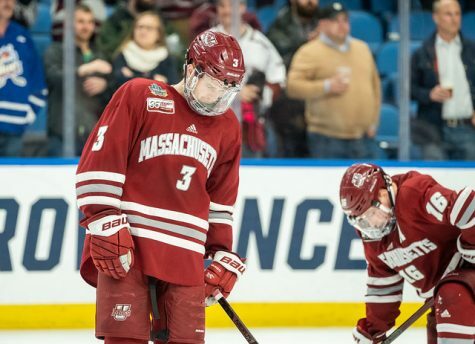 With the way UMass played in the first half of its schedule, it didn’t seem prone to another late-season collapse. The Minutemen, though, struggled after winter break, losing eight of nine games at one point, including a six-game losing streak. 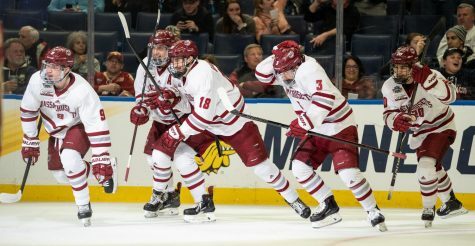 UMass lost its national ranking which it held for a portion of the season, and fell from the top of the Hockey East standings to fighting for a postseason berth. With wins in the last two games, the Minutemen earned a matchup with Boston College in the Hockey East Quarterfinals. The Eagles swept UMass and kept it from advancing. Though the Minutemen look like a different team every season in the first half compared to the second half, they might be starting to figure it out. Maybe next season will be a different story.